April 13, 2016 by Ken Ward Jr. Taking a major step to strengthen liquidity and reduce debt amid an unprecedented industry downturn, Peabody Energy Corporation (NYSE: BTU) today voluntarily filed petitions under Chapter 11 for the majority of its U.S. entities in the United States Bankruptcy Court for the Eastern District of Missouri. Through this process, the company intends to reduce its overall debt level, lower fixed charges, improve operating cash flow and position the company for long-term success, while continuing to operate under the protection of the court process. All of the company’s mines and offices are continuing to operate in the ordinary course of business and are expected to continue doing so for the duration of the process. No Australian entities are included in the filings, and Australian operations are continuing as usual. I’ve posted a copy of their Chapter 11 Petition here. More than three-quarters of Peabody’s production comes from the Powder River Basin, in Wyoming, where the company’s North Antelope Rochelle Mine last year generated 109 million tons of coal, more than all of the mines in West Virginia combined. Twenty years ago, Peabody, through its Eastern Associated Coal Corp. subsidiary, was among West Virginia’s largest coal producers. Today, the company lists no producing mines in West Virginia in its filings with MSHA. 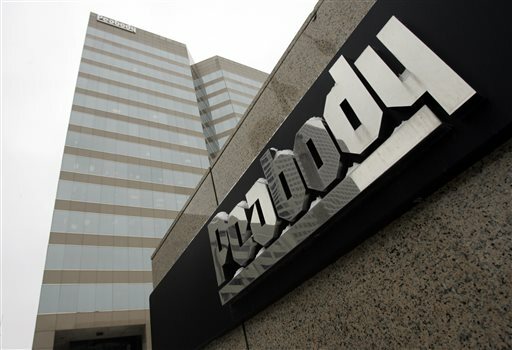 Peabody has no active mining permits on file with the West Virginia Department of Environmental Protection, with all the permits in its name having been reclaimed, said DEP spokeswoman Kelley Gillenwater. The factors affecting the global coal industry in recent years have been unprecedented. Industry pressures in recent years include a dramatic drop in the price of metallurgical coal, weakness in the Chinese economy, overproduction of domestic shale gas and ongoing regulatory challenges.